Hey guys, so my sunglasses came in from KVLT a couple days ago. The sunglasses came in a nice little rectangle box, and they had bubble wrap around them. The box that they came in obviously had my information on it so I didn't want to post that, but they used a very cool gothic font also with their logo on the outside too. I must say it makes them look pretty professional. Oh they also included their business card as well! 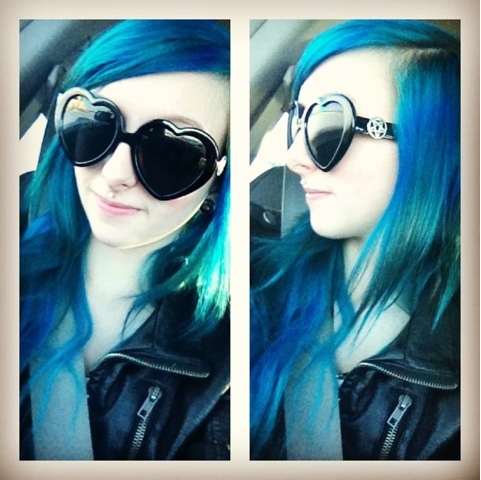 So yeah the sunglasses are black and they are hearts and then there are cute little pentagrams on the side! I'm very impressed with them. So ill just add some pictures of them of course!